First, if it was a tramping in a similar national park in Japan, the majority of those “trampers” were probably senior citizens. In NZ, however, it was the world of gorgeous young boys and girls. Roughly estimating, the average may be the second half of twenties. Anyway, seniors like us in sixties were made to be self-confessed as a sort of heterodox party. Second, those trampers and the cities and towns we passed were the world of Westerners with an atmosphere somewhat being isolated from the real world else. Whereas both of NZ and Australia are well-known multi-cultural and migration countries, as far as the areas where we visited this time, the presence of Asian people was very rare. In particular, those trampers were, as noticed above, stunningly all white people. For me, therefore, the “move” to NZ this time was that to a significantly pure Westerner’s world, although it might be an exceptional experience. Therefore it made me recall significantly the contrast between the East and West. I must have experienced the Western society daily since having been a resident in Australia for long. Because of this probably I have build a sort of buffer zone around me in the course of the nearly 30-year length Australian life. Then, the interface between me and Australia where had a history of colony of white people had been customized to my own style gradually. The “move” to NZ this time makes me recall again my experience of the encounter with the Western world accumulated during those 30 years. Because of this, I was made to focus afresh the contrast between the West-ness there and the East-ness around me. In this lecture, we are going to look at the “stereo view” on many multi-dimensional East-West-move by plotting the difference between the East and the West on the coordinate axes. First of all, to mention my companion for this tramping, he is a dinkum Aussie born in Australia. However, as to his kinship, he is a multi-cultural white person with the father of a Jew born in India and the mother from a famous family of Scotland. In addition, I have never met such a bright person in the ability of actual life like him among my friends and acquaintances. Yet, in terms of knowledge about the affairs of the world, I do not know such a knowledgeable person more than him around me again. So, he has been the most trustworthy person for me in particular at an important decision of any practical affairs. I have kept a close friendship and business partnership with him for more than 20 years. Recently I had been holding an idea to exchange a deep dialogue about a theme on the contrast especially regarding to his own view on the Western society itself. Accordingly I expected that this NZ trip must provide a good opportunity to do it. The theme was a sort of expanding application of the issue in my series of lecture, namely “to move” or “not to move”, to the difference between the East and West. It, as it were, was my biggest hypothesis, namely the “West to move” and the “East not to move”. The Western civilisation is not conceivable without the Age of Discovery. In the Empire Era as a result of the age, the East Asia was the main stage of such West to encounter with the East. Asia up to the time, in particular, Japan, which is an island nation characterised by the certain distance from the Asian continent especially she had closed herself within own terrain, had formed the cultural sphere of non-movement pursuing internal harmony. To put the above contrast in another historical term, it can be said that the West in the modern era and Japan in the feudal era. Of course, it is unreasonable to apply the trait of Japan to the whole Asia. Nonetheless, the East was commonly pursuing their internal prosperity without having the Age of Discovery and the era of colonialism, and this was why the East had gave a longer life to own feudalism. Therefore, although my viewpoint leaps a little, the West could develop a series of abstract world such as finance and science. The “abstraction” endorsed the leaping actions by cutting off the bonds with land and it made the turning point which separates modern from feudal. If pursuing the abstraction by the cutting off the “bonds” further, it can be a very likely outcome that we now witness everywhere the money games which even lost the relevance with the real economy. On the other hand, the East, which did not take the way the West took, naturally pursued to deepen the tie with given environment. This brought a continuation of feudalism on one hand, but the East has nursed a civilisation and a culture which treated the nature harmoniously instead the West treated the natural environment to be conquered on the other. Even though the earth has become smaller today, the human being does not have yet a destination to move awey from the given environment i.e. the earth. In this sense, the means of “move”, “modern” and “abstract” must be less useful any more. On the other hand, in the connection with the seeking harmony with the global environment, the attempt of the East of the “not to move” and to deepen the “tie with land” can be more futuristic for mankind. The response he showed to my proposition was an agreement with a slightly different angle saying; “there was such simplification”. I was expecting a kind of his objection from a Westerner’s point of view. But I, having his almost entire consent to me, not only strengthened confidence of my hypothesis, but also deepened to feel that he must have been making harder own choice on realistic selections because he was a tough but serious practitioner. He is an enthusiastic reader of Yukio Mishima. Then he points out adequately; “Mishima is lousy as a thinker but distinguished as a presenter of Japan’s beauty”. I have never met such a Westerner like him who has unfeigned love and understanding on Japanese culture in my life. As a result, I can put the Eastern world on the quadrant II and the Western world on the quadrant IV of the coordinate axes. 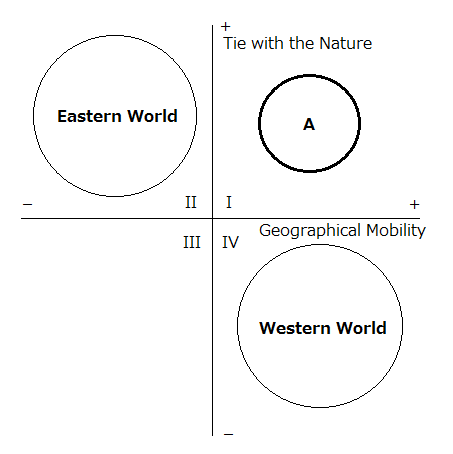 Then, one can find that the quadrant I which is shown as “A” on the coordinate axes is the sphere which is positive on the both axes of “tie with the nature” and “geographical mobility”. This suggests that there is the third world which is active in both; “concretely” and “abstractly”, namely, in both of the East and West. Furthermore, to look back the previous lecture, the shift from “macro” to “micro” in the post-war society can be seen as the phase-transformation from the quadrant II to the quadrant IV of the coordinate axes. In addition, to set up the third axis three-dimensionally on the coordinate axes (in the direction to a reader from the screen), and to assume it as the axis of the depth of “divine world”, the three-dimensional space made up on the quadrant I shown “A” shows a dual-meaning worldview which fuses together the Buddhist-reincarnation-worldview and the Christian-absolute-worldview. I want to name the dual-meaning world as the “unknown multi-dimensional world” which is assumed beyond the four-dimensional time-space of the current our world, and which will be the theme of the next lecture. So to speak, if we personify “the unknown multi-dimensional world”, it may see so-called God world, and if we pursue it as a science, it may see the far-reaching space physics. Of course, I don’t have any means and ability to do such scientific investigation. However, hopefully, I will be able to seek the “unknown multi-dimensional world” as a “quasi-scientific work”. Supposedly, the “unknown multi-dimensional world” should be a chart for the next “move” which makes me imagine the future “Age of Discovery”.